Hi there! Today we discuss about an algorithm. I guess you have already heard of Artificial Intelligence, and especially of some futuristic anticipations in which the world would be governed by robots… Fortunately, we are very far from that. An Artificial Intelligence (AI), Google DeepMind’s AlphaGo, beat the Go professional player Lee Sedol in March 2016. Another AI, IBM’s DeepBlue, beat the then chess world champion Garry Kasparov in May 1997. 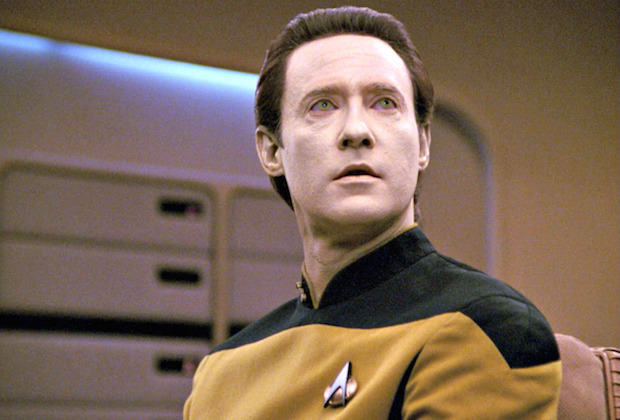 These realizations of specific tasks belong to Narrow AI, while General AI would be Star Trek’s Data, i.e. a man-made system able to interact with its environments, and react better than a human would do. In the context of planetary sciences, AI has recently permitted the discovery of exoplanets, from data analysis. The study I present today, Lunar crater identification via Deep Learning, by Ari Silburt et al., is another example of the way Artificial Intelligence may assist science. 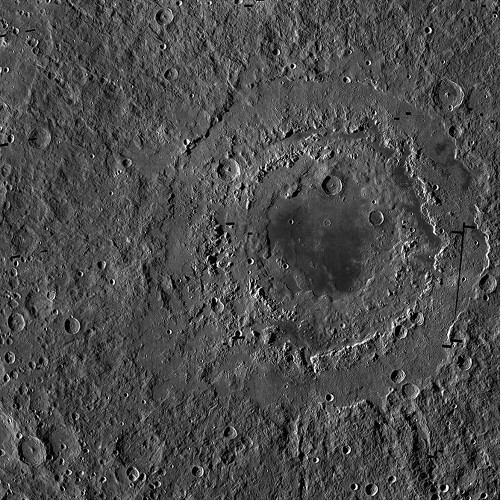 In this paper, the author challenge the computer to identify craters from images of the Moon and of Mercury, and the results appear to be very promising. This study has recently been accepted for publication in Icarus. Let us forget AI for a short while. This is a blog of planetary sciences, remember? AI is a tool, not a goal. This study challenges a tool, which goal will be to identify craters. Hence, the goal is the craters. Craters are ubiquitous in the Solar System, since it is intensively bombarded. This is especially true for the inner Solar System, since the impactors, i.e. small rocky bodies, are gravitationally attracted by the Sun. And while passing by, they may hit us, or the Moon, Mercury, Mars,… And we are lucky, since the current bombardment is much less intense than it was in the youth of the Solar System. Anyway, we have been intensively bombarded, we still are, but our atmosphere protects us in destroying the impactors, which reach the terrestrial surface as meteorites. A huge impactor is thought to be responsible for the extinctions of the dinosaurs, and may be one day… no, better not to think about it. There are not so many craters at the surface of the Earth, partly because our atmosphere has eroded them, and partly because the geophysical activity relaxed them. But what about atmosphereless bodies like our Moon? Craters are everywhere! And craters are the clock of the surface. If you see only craters, it means that the surface has not changed since the impact. The surface did not heat, did not melt, there was no geophysical activity creating failures, ridges,… For instance, in the satellites of Jupiter, you see almost no craters on Io and Europa, since there are active bodies. You see some on Ganymede, which is less active, and much more on Callisto, which is quieter. This is why it is worthwhile to catalogue the craters of a given planetary body. But since it is a difficult and exhausting task, it is probably a good idea to tell a computer how to do it. This is where AI and Deep Learning come into play. As I told you, we are here interested in narrow AI: we want a computer to perform a specific task, and only that task, better than a human would do. And we want the computer to learn how to do it: this is Machine Learning. We give images of craters, tell the computer that they are craters, and we hope it to identify craters on images, which have not been studied yet, i.e. new data. Very well. The inputs are the planetary data. Fortunately, we dispose of numerous topographic data of the Moon, which make it the ideal target for elaborating such an algorithm. the Lunar Reconnaissance Orbiter (LRO). This is an American mission, which orbits the Moon since 2009. It has made a 3-D map of the Moon’s surface at 100-meter resolution and 98.2% coverage, thanks to the Lunar Orbiter Laser Altimeter (LOLA), and the Lunar Reconnaissance Orbiter Camera (LROC). The Japanese mission SELENE (Selenological and Engineering Explorer), which is also known as Kaguya. It was composed of 3 spacecraft, i.e. a main orbiter and two satellites. It operated during 20 months, between September 2007 and June 2009. It was then intentionally crashed near the crater Gill. The authors used such data to train the system, i.e. to make itself an expert in crater identification. Historically, the first identifications of craters were made by visually examining the images. Of course, this is an exhaustive task, and the human being has failures. Moreover, if a small crater looks like a circle, larger ones, i.e. with a diameter larger than 20 km, may have a central peak, may contain other craters, and/or may be altered by the topography (mountains…). The consequence is that beside the time spent to perform this task, you would have false detections (you think this is a crater, but it is not), and miss some craters, especially the smallest ones. If someone else does the same task, from the same data, (s)he would get a significantly different list. Comparing these lists would be a way to estimate the identification errors. So, you can see that the use of the numerical tool is inescapable. But how would you do that? Some algorithms identify the circles on the images thanks to a Hough transform (I do not want to go into specifics, but this is a mathematical transformation of your images which tells you “there is a circle there!”), some identify the edges of the craters, some do both… And Deep Learning is learning by itself how to identify craters. The algorithm detects crater rims from their pixel intensities, then fits a circle on them, and give as outputs the coordinates of the center and the mean radius of the crater. The authors then compared the results with existing catalogues. F1 = 2PR/(P+R), which permits to use a single-parameter metric. The goal is of course to maximize F1. Beside this, the authors also compared the coordinates and radii of the detected craters with the ones present in the catalogues, i.e. which had been previously determined by other methods. And all of this works pretty well! The algorithm detected 92% of the known craters. Moreover, it also announced to the authors the detection of 361 new craters, and showed to be particularly efficient for craters with a diameter smaller than 5 km. Not only these small craters are a challenge for the human eye, but their regular shape makes the automatic detection more reliable. So, you here have an example of a task, for which the computer could be more efficient than the human. Among these 361 new craters, the authors estimate 11% of them to be false positives (Fp). This last number has some uncertainty, since the validation of a crater is made by a human eye, and the outcome depends on the brain, i.e. the human, behind the eye. The Moon is on the left, and Mercury on the right. But the results are pretty good, i.e. many craters are actually detected. The algorithm needs some refinements. For instance, it may be lured by circular depressions, which are not true craters (false positives). But the results are very encouraging, in particular for identifying craters on bodies, for which no catalogue exists at this date. The last space missions have given Digital Elevation Models for Venus, Mars, Vesta, and Ceres, and this algorithm may prove very useful to identify their craters. Deep Learning is the future! You can find the study here, on Icarus’s website. The authors made it also freely available on arXiv, many thanks to them for sharing! The numerical code is freely available on GitHub. And now the authors! and the webpage of Kristen Menou. And that’s it for today! Please do not forget to comment. You can also subscribe to the RSS feed, and follow me on Twitter, Facebook, Instagram, and Pinterest. Hi there! It is a pleasure for me to present you today a multi-disciplinary study, which mixes celestial mechanics with geochemistry. If you want to know the past of a planetary body, you must go backward: you start from the body as you observe it nowadays, and from this you infer the processes which made it evolve from its formation to its present state. In The timeline of the Lunar bombardment – revisited, by A. Morbidelli, D. Nesvorný, V. Laurenz, S. Marchi, D.C. Rubie, L. Elkins-Tanton, M. Wieczorek and S. Jacobson, the authors exploit our observations of the craters and the chemistry of the Moon, and simulations of the motion of asteroids in the early Solar System, to give new constraints on the bombardment of the Moon between 3.9 and 3.7 Gyr (billions of years) ago, which is famous as the Late Heavy Bombardment (LHB). We will see that the results have implications for Mars. This study has recently been accepted for publication in Icarus. Origin of the LHB: cataclysm or accretion tail? Let us start from what we observe: the Lunar surface. This is a heavily cratered surface. Actually, the absence of atmosphere preserves it from erosion, and the small size of the Moon limits its heating, as a consequence the craters neither erode nor relax. Hence, the surface of the Moon is a signature of the activity in the early Solar System. Let us focus on the largest structures, i.e. the maria and the basins. The maria are lava plains, which result from a volcanic activity of the early Moon. However, the basins are the largest impact craters. You can find below the largest ones, of course many smaller craters exist. The early Moon was hot, because of the impact which created it. As a hot body, it stratified into a fluid core, a mantle and a crust, while cooling. The visible impact craters are younger than the crust, i.e. they are younger than 3.9 Gyr, and were created at least 600 Myr after the formation of the Moon… pretty late, hence due to the Late Heavy Bombardment. Cataclysm: the very young Solar System was very active, i.e. composed of many small bodies which collided, partly accreting… and became pretty quiet during some hundreds of Myr… before suddenly, a new phase of bombardment occurred. Accretion tail: the Solar System had a slowly decreasing activity, and the craters on the Moon are just the signature of the last 200 Myrs. The previous impacts were not recorded, since the surface was still molten. The second scenario could be preferred, as the simplest one. The first one needs a cause which would trigger this second phase of bombardment. Anyway, many numerical simulations of the early Solar System got such an activity, as a dynamical phenomenon destabilizing the orbits of a group of small bodies, which themselves entered the inner Solar System and collided with the planets, accreting on them. The giant planets Jupiter and Saturn have a dominant dynamical influence on the small bodies of the Solar System, and could have triggered such an instability. One of the theories existing in the literature is the E-Belt, for extended belt. It would have been an internal extension of the Main Belt of asteroids, which would have been destabilized by a secular resonance with Saturn, and has finished as the impactors of the LHB. Why not, this is a theory. When you model phenomena having occurred several billions years ago, you have so many uncertainties that you cannot be certain that your solution is the right one. This is why the literature proposes several scenarios. Further studies test them, and sometimes (this is the case here) give additional constraints, which refine them. Thanks to the Apollo mission, samples of the Moon have been analyzed on Earth, and geochemistry can tell us many things on the history of a body. For the Moon, focus has been put on siderophile elements. NO NO NO there is actually a problem, since these siderophile elements should be present in the impactors, which are supposed to have accreted on the Moon AFTER its stratification… yes we have a problem. But some of the authors have shown recently that on Earth, another phenomenon could remove the HSEs from the crust, well after the formation of the core: the exsolution and segregation of iron sulfide. In other words, the bombardment could have brought more HSEs than currently recorded. And this motivates to revisite the history of the Lunar bombardment. So, the observations are: the craters, and the HSEs. 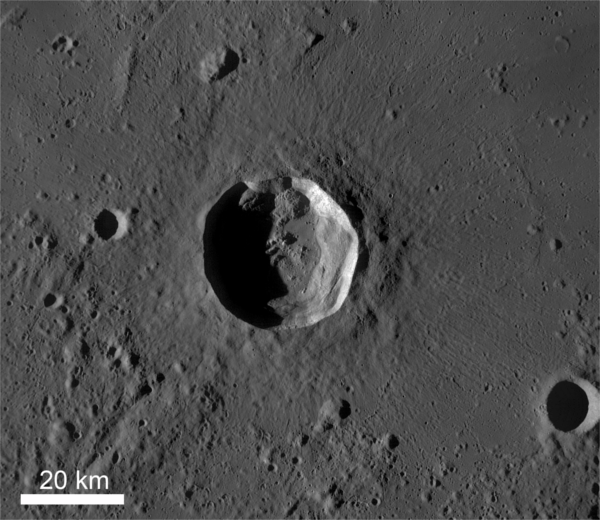 The craters are not only the basins, but also the smaller ones, with diameters larger than 1 km. Even smaller craters could be used, but the data are considered to be reliable, i.e. exhaustive, for craters larger than 1 km. From that size to the large basins, we can fit a function of distribution, i.e. number of craters vs. diameter. Since there is an obvious correlation between the size of a crater and the one of the impactor, a population of craters corresponds to a population of impactors. The authors dispose of statistics of collisions, which could be seen as mass accretion, between the Moon and small bodies during the early ages of the Solar System. These statistics result from numerical simulations conducted by some of them, and they can be fine-tuned to fit the crater distribution, their estimated ages, and the abundance of highly siderophile elements. Fine-tuning the statistics consist in artificially moving the parameters of the simulation, for instance the initial number of small bodies, or the date of the instability provoking the cataclysm, in the cataclysm scenario. And here is the result: if the HSEs are only due to the mass accretion after the cooling of the Lunar crust, then the observations can only be explained by the cataclysm, i.e. the LHB would be due to a late instability. This instability would have resulted in a mass accretion from comets, and this raises another problem: this accretion seems to lack of primitive, carbonaceous material, while the comets contain some. However, if the HSEs have been removed after the cooling of the crust, then the accretion tail scenario is possible. We should accept that for this kind of study, the solution is not unique. A way to tend to the unicity of the solution is to discuss further implications, in examining other clues. And the authors mention the tungsten. Tungsten is rather a lithophile than a siderophile element, at least in the presence of iron sulfide. In other words, even if it does not dislike iron, it prefers lithium (I like this way of discussing chemistry). Something puzzling is a significant difference in the ratios of two isotopes of tungsten (182W and 184W) between the Moon and the Earth. This difference could be primordial, as brought by the projectile which is supposed to have splitted the proto-Earth into the Earth and the Moon (nickname of the projectile: Theia), or it could be due to the post-formation mass accumulation. In that case, that would be another constraint on the LHB. The LHB has affected the whole inner Solar System. So, if a scenario is valid for the Moon, it must be valid for Mars. This is why the authors did the job for Mars as well. A notable difference is that Mars would be less impacted by comets than the Moon, and this would affect the composition of the accreted material. More precisely, a cataclysmic LHB would be a mixture of asteroids and comets, while an accretion tail one would essentially consist of leftover planetesimals. It appears that this last scenario, i.e. the accretion tail one, can match the distribution of craters and the abundance of HSEs. However, the cataclysmic scenario would not bring enough HSEs on Mars. The quantity of remaining HSEs on the Moon is correlated with the crystallization of the Lunar magma ocean, which itself regulates the age of the earliest Lunar crust. For Mars, the Noachian era would have started 200 Myr earlier than currently thought, i.e. 4.3 Gyr instead of 4.1 Gyr. That period is characterized by high rates of meteorite and asteroid impacts and the possible presence of abundant surface water. Moreover, the Borealis formation, i.e. the northern hemisphere of Mars, which seems to be a very large impact basin, should have been formed 4.37 Gyr ago. Further studies, explorations, space missions, lab experiments,… should give us new data, which would challenge these implications and refine these scenarios. So, the wording prediction can seem weird for past phenomena, but the prediction is for new clues. The study, made freely available by the authors on arXiv, thanks to them for sharing! and the one of Seth A. Jacobson. And that’s it for today! Please do not forget to comment. You can also subscribe to the RSS feed, and follow me on Twitter and Facebook. Hi there! You may know that our Solar System has had a catastrophic youth, destructive impacts playing an inescapable role in sculpting its structure. The paper I present you today, Constraints on the pre-impact orbits of Solar System giant impactors, by Alan P. Jackson, Travis S.J. Gabriel & Erik I. Asphaug, proposes an efficient way to determine the orbit of a giant impactor before the impact. This tells us where this impactor could have come from. The study has recently been published in The Monthly Notices of the Royal Astronomical Society. In its early history, the Solar System was composed of many small bodies, i.e. many much than now, most of them having been cleared since then. They have been cleared because the gravitational perturbation of the planets made their orbits unstable. They may also have been destroyed by collisions. Before the clearing was completed, the presence of so many bodies favored intense bombardments. You know for instance the Late Heavy Bombardment (LHB), which probably happened 4 Byr ago, during 200 Myr. The violence and the outcome of an impact depend on the relative sizes of the target and the impactor, and their relative velocities. Here, the relative velocity should be seen as a vector, i.e. not only the velocity itself is important (the norm of the vector), but its orientation as well, since it directly affects the incidence angle. The craters on the surface of telluric planets, asteroids, and planetary satellites tell us about the history of the bodies, and are the signature of such bombardment. They have been excavated by impactors of moderate size. But now, imagine that the impactor has the size of a planetary body. This is what the authors address as giant impactors. The last case is known as hit-and-run. It happens when the impact is tangential, like between two billiard balls. But it is a little more complicated, of course. This last decade has seen the publication of many Smooth Particle Hydrodynamics (SPH) simulations, in which the impactor and the target are modeled as aggregates of particles. Their mutual interactions are of course considered. Such simulations permit to model the differentiated composition of the two involved bodies, i.e. heavy elements constitute the core, while lighter ones make the mantle, and to trace the outcome of the different geochimical components during and after the impact. This way, the results can be compared with our knowledge of the composition of the bodies. We can evaluate which fraction of the material of the impactor is finally reaccreted on the target, and we can also determine the consequences of hit-and-run collisions. It appears that these collisions do not leave the two bodies intact, but they may strip them from their outer layers. It appeared from the simulations and from the observed compositions of planetary bodies, like the Earth-Moon pair, that impacts do affect the composition of the resulting bodies, and that the difference of composition between the target and the impactor may result in variations of composition after the process is completed, i.e. not only the collision, but also the coalescence of the dust cloud and the reaccretion of the debris. Determining the composition of an impacted planetary body can tell us something on the composition of the impactor. The composition of planetary bodies depend on their location in the Solar System. The distance with the Sun affects the temperature, which itself affects the viscoelastic properties of the material. Moreover, the initial protoplanetary nebula which gave birth to the Solar System had probably a radial dependent composition, which affected the composition of the resulting planetary bodies. If we could know where an impactor came from, that would tell us something on the primordial Solar System. In 2014 the first author, i.e. Alan P. Jackson, while he was in UK, lead a study in which the orbital elements of the impacted bodies were determined, in modeling the impact as an impulsive velocity kick. In the present study, the authors invert the formulae, to get the pre-impact elements from the post-impact ones, which are observed, and from the impact velocity, which is estimated by other studies. This seems easy, but actually is not. One of the problem is that the uncertainties on the impact velocity translates into a family of possible pre-impact elements. Anyway, they give constraints on the semimajor axis, eccentricity and inclination of the impactor. Something very interesting with this method is that the inversion of analytical formulae is very fast with a computer, i.e. you can have the result in a few seconds, maybe less, while the classical method would consist to run N-body simulations during days, where you model the motions of thousands of candidate-impactors (of which you know nothing), until you observe a collision… or not. In determining the possible pre-impact orbital elements, the authors can assess whether the impactors are likely to fall on the Sun, or to cross the orbit of another planet. In particular, a Sun-grazing solution should obviously be rejected. Moreover, the authors consider that an impactor which would have crossed the orbit of Jupiter would probably have been ejected from the Solar System. As a consequence, such a solution has only a low probability. And now, let us have a look at the results! The authors applied their method on the formation of the Moon, of Mercury, and on the northern hemisphere of Mars. A violent scenario, which assumes that the Earth spun very fast at the time of the impact, and that the total angular momentum of the Earth-Moon system was twice the present one. This last scenario requires high impact velocities. It appears from the results that the last of these scenarios, which requires high velocities, is much less probable than the others, because high velocities translate into highly eccentric orbits. Highly eccentric orbits are the less stable ones, in particular many of them cross the orbit of Jupiter, which could eject them from the Solar System. So, a conclusion of this study is that the formation of the Moon probably results from a low velocity impact between the proto-Earth and Theia. The composition of Mercury is intriguing, since it is anomalously dense with respect to its size. It is as if the observed Mercury would only be the core of a planet. A proposed explanation is that the proto-Mercury was composed of that core and a mantle of lighter elements (an alternative one is a depletion of lighter elements in the protoplanetary nebula in that region of the Solar System). And of course, it has been imagined that the removal of the mantle is due to a giant impact. A succession of hit-and-run collisions in which the proto-Mercury would have been the impactor on the proto-Earth and / or the proto-Venus, and which would have been progressively enriched in iron. The authors consider the multiple hit-and-run scenario as the most probable one, since it is the one involving the smallest velocities, and limits the possibility of gravitational scattering by Jupiter. 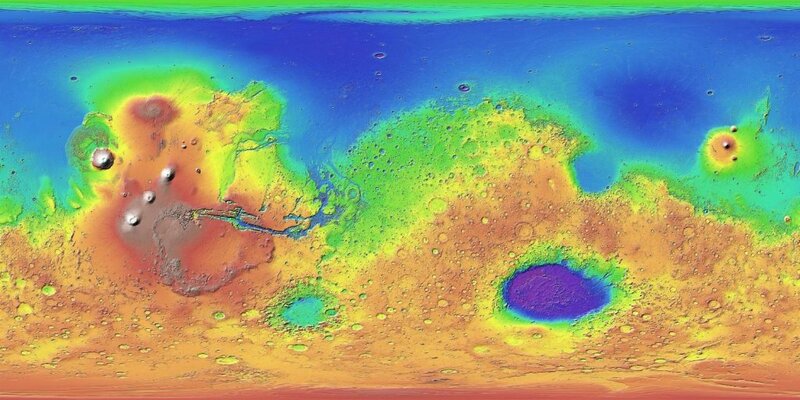 The North Polar Basin of Mars, or Borealis Basin, covers 40% of the surface of Mars. It may be the largest impact basin in the Solar System, and it creates a dichotomy between the northern and the southern hemispheres. The authors stress that the exact location of Mars at the date of the impact does affect the results, in particular Earth-crossing orbits are allowed only is Mars was close to its pericentre (the location on its orbit, where it is the closest to the Sun). Anyway, they find that the impactor should have had an orbit close to the one of Mars, and suggest that its semimajor axis could have been between 1.2 and 2.2 astronomical unit (the one of Mars being 1.52 AU). and the one of Erik I. Asphaug. Hi there! Did you know that there could be avalanches on the Moon? Why not? You have slopes, you have boulders, so you can have avalanches! Not snow avalanches of course. This is the topic of Granular avalanches on the Moon: Mass-wasting conditions, processes and features, by B.P. Kokelaar, R.S. Bahia, K.H. Joy, S. Viroulet and J.M.N.T. Gray, which has recently been accepted for publication in Journal of Geophysical Research: Planets. No liquid water: This means no snow! This is why you have no snow avalanche. Another consequence of this absence of fluid is that no rain can trigger an avalanche, and the regolith involved is necessarily dry. Wet sand does not behave like dry sand. Less gravity: The gravity on the Moon is about one sixth of the gravity of the Earth, and as you can imagine, gravity assists the avalanches. It appears that a smaller gravity results in slower avalanches, but the final result remains pretty the same, i.e. you cannot infer the gravity from the final result of an avalanche. The irregularity of the Moon’s topography is mainly due to the numerous impact craters. The steep edges of the craters are where avalanches happen. For an avalanche to happen, you need a favorable terrain, and a triggering event. A favorable terrain is first a slope. If you are flat enough, then the boulders would not be inclined to roll. The required limit inclination is called the dynamic angle of repose. On Earth, the dry sand has a dynamic angle of repose of 34°, while the wet sand remains stable up to 45°. This illustrates pretty well the influence of the water. Triggering an avalanche requires to shake the terrain enough. A way is an impact occurring far enough to not alter the slope, but close enough to shake the terrain. Another way is a seismic phenomenon, due to geophysical activity of the Moon. The first 4 of these craters are situated in maria, while the last three are in highlands. These means that we have different types of regolith. Images from the LROC, for LRO Camera. This instrument is equipped of 3 cameras, two Narrow Angle Cameras (NACs), with a resolution between 0.42 and 1.3 meter per pixel, and a WAC, for Wide Angle Camera, with a resolution of 100 m /pixel, but with a much wider field. The NAC data permitted to characterize the type of flow, while the WAC data gave their extent. Digital Elevation Models (DEM), obtained from the Lunar Orbiter Laser Altimeter (LOLA), mentioned here, and from the Terrain Camera of the Japanese mission SELENE / Kaguya. Knowing the variations of the topography permitted to estimate the slopes of the craters and the volume of flowing material. Multiple Ribbon (MR): these are very elongated flows with respect to their widths, i.e. they are typically kilometer-long and meter-wide. 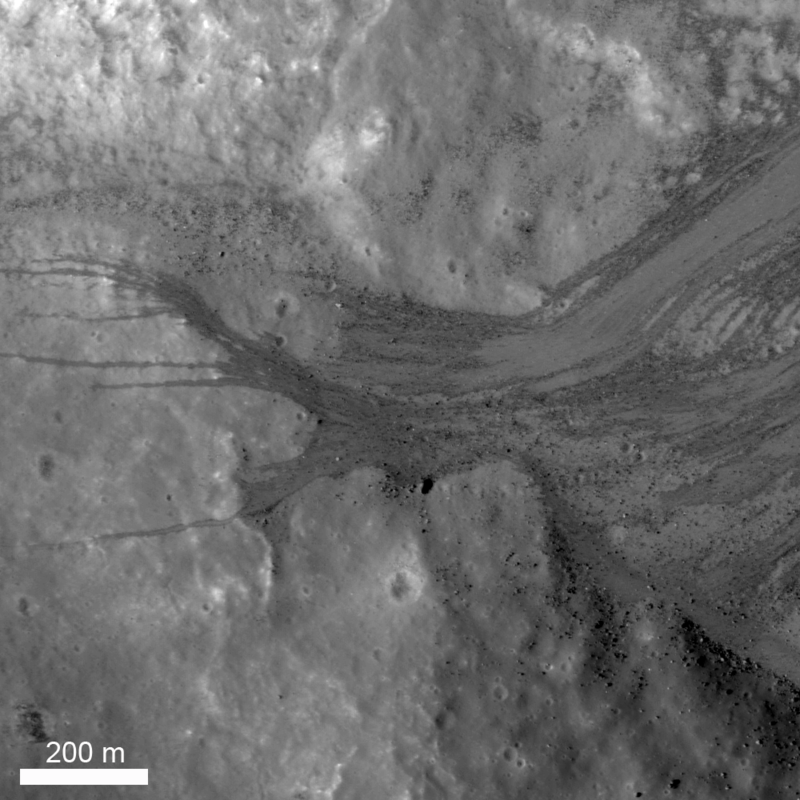 These flows have been predicted by lab experiments, but this is their first observation on a planetary body. In particular, they are not present on the Earth. Lab experiments suggest that they are extremely sensitive to slope changes. The word flow evokes a fluid phenomenon. Of course, there is no fluid at the surface of the Moon, but granular regolith may have a kind of fluid behavior. A true fluid would have a dynamic angle of repose of 0°. Regolith has a higher angle of repose because of friction, that prevents it from flowing. But it of course depends on the nature of the regolith. In particular, fine-grained material tends to reduce friction, and consequently increases the mobility of the material. This results in extended flows. But this extension has some limitation. On Earth, we observe flows on adverse slopes, which are thought to be facilitated by the presence of liquid water. This statement is enforced by the fact that no such flow has been observed on the Moon. The accuracy of data we dispose on the Moon has permitted the first observations of granular flows in dry and atmosphereless conditions. Such results could probably be extrapolated to other similar bodies (Mercury? Ceres? Pluto?). The multiple ribbon have been predicted by lab experiments. It is fascinating to realize that we can reproduce lunar condition in a room, and with accelerated timescales. This is made possible by the normalization of physical quantities. In this problem, a critical number is the Froude number, which depends on the gravity, the avalanche thickness, the velocity, and the slope. The study, which is freely available for everyone since the authors paid for Open Access. Many thanks to them! and the one of Nico Gray. That’s it for today! Please do not forget to comment. You can also subscribe to the RSS feed, and follow me on Twitter and Facebook. Hi there! The Moon is so close and so familiar to us, but I realize this is my first post on it. Today I present you a paper entitled South Pole Aitken Basin magnetic anomalies: Evidence for the true polar wander of Moon and a lunar dynamo reversal, by Jafar Arkani-Hamed and Daniel Boutin, which will be published soon in Journal of Geophysical Research: Planets. The idea is to track the variations of the magnetic field of the Moon along its history, as a signature of the motion of its rotation pole, i.e. of a polar wander. The Moon is a fascinating object, as it is the only known natural satellite of the Earth, and we see it as large as the Sun in our sky. It orbits around the Earth at a distance of almost 400,000 km in 27.3 days. It shows us always the same face, as a result of a tidal locking of its rotation, making it synchronous, i.e. its spin period is equal to its orbital period. 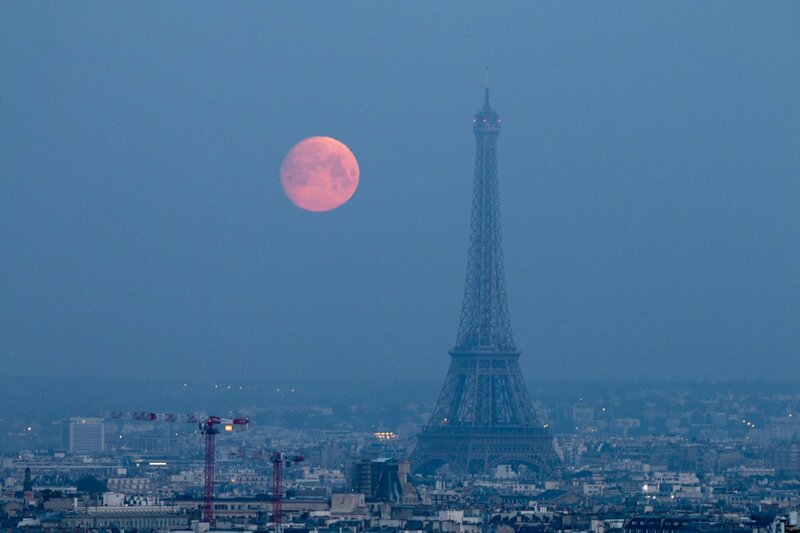 Moonset over Paris, France. Copyright: Josselin Desmars. Something interesting is its pretty large size, i.e. its radius is one fourth of the one of the Earth. It is widely admitted that the Moon and the Earth have a common origin, i.e. either a proto-Earth has been impacted by a Mars-sized impactor, which split it between the Earth and the Moon, or the Earth-Moon system results from the collision of two objects of almost the same size. In both cases, the Earth and the Moon would have been pretty hot just after the impact, which also means active… and this has implications for the magnetic field. A very weak magnetic field has been detected for the Moon, but which is very different from the Earth’s. The magnetic field of the Earth, or geomagnetic field, has the signature of a dipolar one, in the sense that it has a clear orientation. This happens when the rotating core acts as a dynamo. The north magnetic pole is some 10° shifted from the spin pole of the Earth, and has an amplitude between 25 and 65 μT (micro-teslas). However, the magnetic field of the Moon, measured at its surface, does not present a clear orientation, and never reaches 1 μT. Its origin is thus not obvious, even if we could imagine that the early Moon was active enough to harbor a dynamo, from which the measured magnetic field would be a signature… But the absence of preferred orientation is confusing. The core of the Earth spins, it is surrounded by liquid iron, which is conductive, and there is convection in this fluid layer, which is driven by the heat flux diffusing from the core to the surface of the Earth. This process creates and maintains a magnetic field. For the Earth, the core dynamo is assumed to account for 80 to 90% of the total magnetic field. This results in a preferred orientation. Other processes that could create a magnetic field are a global asymmetry of the electric charges of the planet, or the presence of an external magnetic field, for instance due to a star. A dynamo could be expected for many planetary objects, which would be large enough to harbor a global fluid layer. It is usually thought that the detection of a magnetic field is a clue for the presence of a global ocean. Such a magnetic field has been detected for Jupiter’s moon Ganymede, which is probably due to an outer liquid layer coating its iron core. The Moon has probably no dynamo, but could have had one in the past. The measured magnetic field could be its signature. A question is: what could have driven this dynamo? 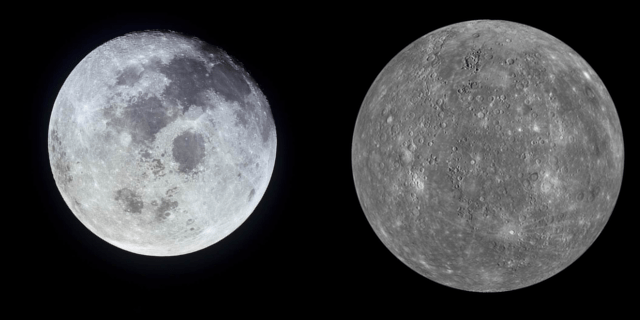 The early Moon was hotter than the current one, so a magnetic field existed at that time. And after that, the Moon experienced intense episodes of bombardment, like the Late Heavy Bombardment. The resulting impacts affected the orientation of the Moon, its shape, and also its temperature. This could have itself triggered a revival of the magnetic field, particularly for the biggest impact. The study I present today deals with measurements of the magnetic field in the South Pole-Aitken Basin, not to be confused with the Aitken crater, which is present in its region. The South Pole-Aitken Basin is one of the largest known impact crater in the Solar System, with a diameter of 2,500 km and a depth of 13 km. This basin contains other craters, which means that it is older than all of them, its age is estimated to be 4.1 Gyr (gigayears, i.e. billions of years). Measurements of the magnetic field in each of these craters could give its evolution over the ages. But why is it possible? When a material is surrounded by a magnetic field, it can become magnetic itself. This phenomenon is known as induced magnetization, and depends on the magnetic susceptibility of the material, i.e. the efficiency of this process depends on the material. Once the surrounding magnetic field has disappeared, the material might remain magnetic anyway, i.e. have its remanent magnetic field. This is what has been measured by the Lunar Prospector mission, whose data originated this study. An issue is the temperature. The impact should be hot enough to trigger the magnetic field, which implies that the material would be hot, but it cannot be magnetized if it is too hot. Below a Curie temperature, the process of induced magnetization just does not work. You can even demagnetize a material in heating it. For the magnetite, which is a mineral containing iron and present on the Moon, the Curie temperature is 860 K, i.e. 587°C, or 1089°F. This study uses data of the Lunar Prospector mission. This NASA mission has been launched in January 1998 from Cape Canaveral and has orbited the Moon on a polar orbit during 18 months, until July 1999. It made a full orbit in a little less than 2 hours, at a mean altitude of 100 km (60 miles). This allowed to cover the whole surface of the Moon, and to make measurements with 6 instruments, related to gamma rays, electrons, neutrons, gravity… and the magnetic field. This study essentially consists of two parts: a theoretical study of the temperature evolution of the Moon over its early ages, including after impacts, and the interpretation of the magnetic field data. These data are 14 magnetic anomalies in the South Pole-Aitken Basin, which the theoretical study helps to date. And the data show two orientations of the magnetic field in the magnetic in the past, giving an excursion of more than 100° over the ages. Now, if we consider that in the presence of a core dynamo, the magnetic field should be nearly aligned with the spin pole, this means that the Moon has experienced a polar wander of more than 100° in its early life. More precisely, the two orientations are temporally separated by the creation of the Imbrium basin, 3.9 Gyr ago. In other words, the Moon has been tilted. This is not the only case in the Solar System, see e.g. Enceladus. The study. You can also find a shortened version as a conference abstract, here. The web page of Jafar Arkani-Hamed.